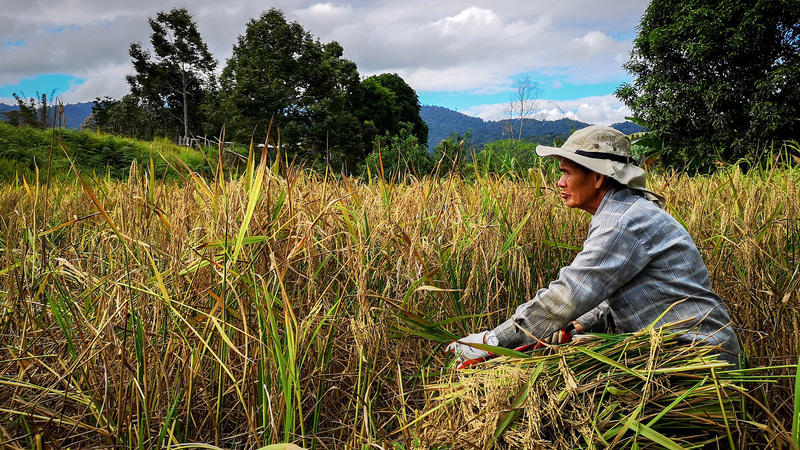 Once a year, the fields of Long Semadoh Valley turns golden, bursting with ripe paddy. Join our farmers as they hit the fields, going out full force to harvest their labour of love. This season, you will be fully immersed in the art of harvesting that will see local experts turning paddy into delicious rice. Experience the making of in-season indigenous food, all set and framed within the majestic mountainous backdrop. More importantly, you will also experience the unforgettable warmth of Lun Bawang hospitality. The Langit team will guide you through this uniquely curated season. “I’ve always preferred sea over the mountain. But now I’m not sure anymore. This place stole my heart”, Hani 2019. *Booking starts in October 2019. Trek through history in a 1 hour scenic walk starting from the Long Semadoh airport towards the village of Long Tanid. Discover the story of the Lun Bawang people through remnants from the past. Take time to reflect and enjoy nature as is in the evenings. Head to the fields and start harvesting with the farmers. Gain an insight into the various traditional processes involved in turning paddy into rice. Fill your afternoons with casual learning sessions. Learn about indigenous food through foraging and the making of various traditional rice-centered meals. Stop over at Long Lidung Village to visit the freshwater river fish conservation. This is a community-run project headed by a passionate local, Pak Raut. You will be get to soak your feet in the river and maybe even get a natural fish spa session! Arrive in Lawas by noon. End of tour. 3pm : Depart Lawas to the village of Long Semadoh Naseb in Long Semadoh Valley. 11am: Brunch by the river (picnic style) and enjoy a cold dip. 7.30am: Head to the paddy fields and start harvesting with local farmers. 2pm: Back to the fields for round 2. Stop over at Long Lidung Village to visit the freshwater river fish conservation. Ground transportation by 4x4 covers duration of travel mentioned in the 5days 4 nights itinerary only. All basic meals for the duration of the trip are covered. Entrance fee to Long Lidung village’s river conservation site. Travel insurance for duration of tour (Malaysians only). Flights or transportation to town of Lawas, Sarawak. All cost incurred during free & easy sessions. Fly in to Kota Kinabalu (KK), Sabah and take a bus/ van to Lawas. Reservations must be made before 30 November 2019. Space is based on first-come-first serve basis. Cancellations made less than 24 hours before the start of the trip will be subject to a charge equal to 100% of the booking. Cancellations made 1 to 3 days before the start of the trip will be subject to a charge equal to 50% of the booking. A non- refundable deposit of RM200 is payable to Langit Collective Sdn.Bhd. (Unless tour is cancelled by Langit). Balance fee of RM1,100 to be collected upon booking deadline on 30 November 2019. Fees to be made to Langit Collective Sdn.Bhd., CIMB account - 8009508640. Travellers must be in good physical condition without any medical complications. This backpacking/adventure style trip requires an independent spirit and an open mind..
Be mentally prepared for bumpy roads in the mountainous region, and/or potential delays due to weather conditions. Village surroundings are basic and can be muddy when it rains. Communication. Telco connectivity is unreliable and mostly unavailable at most times. Maxis works best when connectivity is available. Outdoor gears and shoes suitable for all terrain trekking , jacket for cold nights.